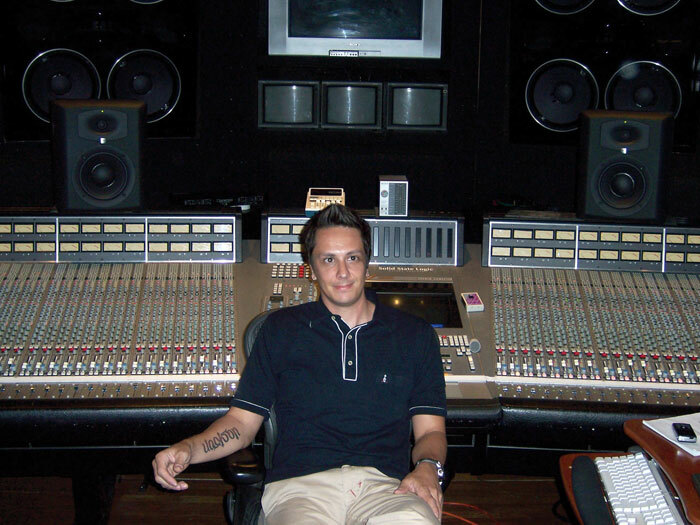 Jason Goldstein is a Grammy®-winning, and ten-time Grammy®-nominated mix engineer based in New York City. He got his start in the music business as a DJ in the clubs of Washington, DC, spinning old school hip-hop, R&B, house and new wave. After graduating from high school, he moved to L.A., where he started out sandblasting floors, washing dishes, and running errands at L.A.’s famed Ocean Way Studios, eventually working his way up to mixing. During the past 20 years, he has turned into one of the most in-demand mixers in the contemporary R&B/hip-hop scene, working with artists including Beyoncé, Jay Z, The Roots, Ludacris, Jill Scott, R. Kelly, Michael Jackson, Fleetwood Mac, David Bowie, LL Cool J, legendary production team Trackmasters (Will Smith, Nas) and many others as well as for companies such as Avid, JBL, AKG and Sonnox Plug-Ins. Jason is best known for his Grammy-winning mixing on Beyoncé’s BDay, an album that has racked up 3.5 million sales worldwide, and won a Grammy for Best Contemporary R&B Album. Most recently, he mixed comedic pop rock group The Lonely Island’s The Wack Album and Turtleneck & Chain. Jason’s work has been featured in Mix Magazine, Sound On Sound, SonicScoop and Pro Sound Web. He currently works mainly in his home studio and at Downtown Music Studios in New York City. Jason talked to me about how he built a solid career as a mixer over two decades and what it takes to be a successful engineer in the current climate. He also shared some advice for artists and producers looking to choose the right mix engineer for their projects. Thanks for taking some time to chat, Jason. So, you started out in the music business working at Ocean Way Studios. I moved to L.A. right out of high school with no intention of getting in the music industry. I was a DJ, and I had responded to an ad in The Recycler, which was a huge print newspaper similar to Craigslist. I applied for a job at a recording studio, because I thought it would be a cool place to work. I had no idea what Ocean Way was or what into making records. I walked in, and there was one record after another on the wall, going back to things like Pet Sounds and albums by Nat King Cole. At first, I thought Ocean Way was kind of a funny, dumpy place, as it hadn’t been remodeled since the 1970s. I now know there’s a reason for that, because the rooms sound amazing. And the talent of the producers, engineers and assistants working there was just incredible. I basically walked in and didn’t leave for three years, working about 80-100 hours a week. I was a runner from 6 p.m. in the evening until the last session left, which was often three or four a.m. Then there would be six rooms to clean, and we’d have to set up for a session the next day. Then I would stay the next morning and work on sessions for free to build my skills, go home and sleep for a couple hours and come back in the evening. I was very fortunate to work with some very famous, skilled producers and engineers. But as I said, many of the assistants at Ocean Way were as good as some of those engineers, just waiting for their big break. And they were the ones that took me under their wing and taught me the trade. It was just a phenomenal place to work. How did you segue into successfully doing your own thing? What do you think you did that kept you employed when so many other people fell by the wayside? It’s a little tougher now than it used to be, because so much more music is being recorded in small studios or people’s bedrooms. That being said, how I and everyone else from my generation that is successful did it is by becoming someone’s favorite assistant. I worked a lot with Arif Mardin and Phil Ramone in L.A. I also often worked with Hans Zimmer’s engineer Alan Meyerson. Whenever he had a big string date, he would have me be his assistant. I ended up setting up studios for him and doing freelance work for Hans. There is also a producer named David Gamson, who on a couple different occasions would hire me to do an over-dub when he had one that didn’t require an A-list engineer. For me, being successful really has been about being available and able to do whatever was asked of me. It was also about putting in the work. These people appreciated me being available to work hard. And because you have to work with somebody for 12 hours a day in a room, you have to have good people skills. You have to be a good “hang,” or the people in the room are going to kill each other. You really do. I would rather have an assistant that is not as qualified, who is a good guy or girl and open to learning and honest about strengths and weaknesses than someone that acts like they know everything and is kind of standoffish. There’s an etiquette that goes along with being in a creative situation: You have to be able to read the room and know when to sit like a mouse in the corner and when it’s okay to speak up or have a beer with the client. To answer your original question as directly as possible, being successful as an engineer is about having people skills, the willingness to learn and attaching yourself to another producer or engineer that you can learn from. I will funnel work to assistants when I am too busy to take on a new client. There is a short list of people that get a call from me in that situation. That’s interesting. I think we are of the same generation, and guys our age often did glorified slave labor just to get into the room and meet people who might help them build careers. How are people finding gigs as engineers and producers now in a climate where there are so many small and home studios? What advice would you give someone that wanted to make their way in the business in this day and age? When I was starting out, there were not many schools that taught engineering. The studios were where you learned the trade, and I don’t think there’s any substitute for that. That being said, because there are fewer studios, colleges and universities are playing a bigger part in engineers’ success. I think studying at one of those schools gives you a leg up in terms of theory and other finer points. You can learn a lot online, too with all the YouTube videos. But there are still enough studios out there that if you present yourself in the right way, you can still get mentored. If you go somewhere like Berklee College of Music, if you’re more engineering oriented, you can hook up with someone else who is in school there and make your own team. You can also offer to record the music majors there. I know that’s intrinsic in the program anyway. The point is, you just never know who the next big producer is going to be, or who will be the next big cellist, guitarist or songwriter. You just need to put yourself in as many situations where you will get to practice your skill as possible. You can also get a job working for free at a studio, hopefully one with a decent turnover and client list. For example, in New York, there’s still Avatar, which is a great studio that still has vintage equipment. So, if you can get a gig there, you will still learn how to record drums from some of the best guys out there. Then, there are smaller studios around town that work more in mixing. And for indie rock, there’s The Magic Shop. There are a lot more places to go in L.A. than there are in New York. Miami also has some great places. But you need that studio exposure. One of the biggest issues I have with kids just coming out of school is that they only know one way to do things. And in reality, there are just so many different ways to record and mix music. Still, I often learn from these people fresh out of school, because, while I have always been an early adopter, the older I get, the more caught up in my own system I can be. I’m not an 18-year old in school living and breathing the newest technology every day. But that is a skill set I can use, and it will benefit me to have access to someone that has a skill set I don’t have. No one can know everything. It really is true that if you try to be a jack of all trades – and a lot of young engineers coming up today are trying to be – you are a master of none. I feel that attempting to do everything yourself can create a mediocre end result in the studio. There’s a reason why the best songwriters team up with the best producers and engineers and why none of them try to do everything themselves: to create a superior product. The product is only as strong as its weakest link. You’ve won a Grammy® and have been Grammy®-nominated ten times in total. How did you go from being a guy just trying to work steadily with clients of all different experience and skill levels to a guy who is at the top of his game? In other words, how did you go from having a good business to a great one? Hard work and perseverance have been important. And some of my success has been about luck – being in the right place at the right time. But luck only gets you so far. You have to deliver once you’re fortunate enough to meet someone big land a gig. I was always a big fan of hip-hop and R&B. And when I moved to New York City, I continued to work for Arif Mardin, Phil Ramone and a lot of other people. And the Trackmasters came into the studio I was working at one day. They did all of Will Smith’s biggest records, including “Gettin’ Jiggy With It” and “Miami.” They also did a bunch of music for LL Cool J and Destiny’s Child. They were hot in the mid-‘90s when I came to New York. When they came in, I just bugged their production person until they let me work with them. I was willing to do anything, and eventually I started doing B-list sessions and tracking B-list vocals. Back then, you did rough mix to DAT every night, so I would stay late and put together the best mix I could possibly do. Eventually, their normal guy wasn’t available for a mix, and they asked me to do it, because they felt my rough mixes were just as good as what they were getting back from the other guys. And that’s how I got the gig. I started mixing everything for them, and they became executives at Sony and hired other producers. They knew I could deliver a mix they liked, so they hired me to mix work by those producers, who in turn became clients. Then your name gets on some records. I ended up doing a big Jay-Z record. I was fortunate enough to be able to learn from some of the best, and I’m able to translate what the producer hears in their head and give them what they want. I also strive to make every song sound the best in every environment. It needs to sound as good in a car as it does in a club and anywhere else. I think Quincy Jones said it best when he said, “Outhouse on the bottom and penthouse on the top,” meaning, it is big and full, but it also has clarity and cleanliness where it counts, which is usually in the upper registers. I had never heard that quote. It’s a great one. Those 80-100-hour weeks with the Trackmasters were really important to building my career. They would have two rooms at the Hit Factory going, and I would go back and forth. At one point, I had two mix rooms going simultaneously at Sony before the bottom fell out of the music industry. I hate to generalize, but there’s sometimes a sense of entitlement with the kids coming up today. They think that because they busted their asses in school, they can just coast through the rest of their careers. I think you have to have the mindset that you’ll be starting over once you come out of school. I sandblasted the floor and tarred the roof at Ocean Way before I got to work in the studio. Then I worked my way up to working with Hans Zimmer on film scores. Then, when I moved to New York, I had to go back to assisting again, because I didn’t have enough clients to support myself here. I went from as low as you could go, to engineering on my own and making a good living on it, back to assisting for a third or less of what I was making. I had to build my way back up again. The key is being flexible and willing to absorb everything you can. Just to switch the focus to artists for a bit, what advice would you give for those looking to hire the right mix engineer for their records? Obviously you have to listen to a lot of records and do some research. Obviously, the main thing is that if you hear a record you like and want your record to sound similar, the guy who mixed it is the guy you want to hire if you can afford him. That being said, if you are a producer, you have to be realistic: Does your record sound like that record? The sound you can achieve is really all about the source. I’ve gotten records from someone who says, “I want this to sound just like X record you just mixed.” But, the person’s record is never going to sound like that, because it doesn’t have the right elements. I would need to do some production-related work on it to get it in the ballpark. The source has to be compatible with the finished product. An each song has to be taken on its own merit. I definitely think people overestimate what a mix engineer can fix. If you what you track isn’t good, there’s only so much a mix engineer can do. In this day and age, there is a lot I can do to sonically correct something. But if it’s a bad record, it’s a bad record. I can make it sound amazing, but it will still be a bad record. And my job is really to make every record sound amazing. It’s not my fault the melody’s not good or the playing wasn’t good. As a producer coming up, you have to understand how to record things and what elements sound good together. For example, I get a lot of records where the kick drum sounds good and the snare sounds good, but it’s clear the producer never considered what everything would sound like together. At the end of the day, all the parts are coming out of a speaker and hitting someone’s ears at the same time as one entity. The quality of the recording is really crucial. If there is a ton of air conditioning hum, and the vocals are over-compressed and distorted, I can’t do anything about it. If we’re talking about tuning guitars, replacing drums and adding some more elements to make it a little more interesting, I can make that happen. But a really poorly-recorded record gives me fewer options. Also, when you’re feeling out a mix engineer, you need to talk to the guy. Don’t send out your record to him and then just expect magic to come back. You have to go through revisions with people. Music is subjective. If you don’t tell a mix engineer anything specific other than, “Do what you do best,” you can’t be upset by any result you get. As a producer, be cognizant of what you are delivering to the mixer and be specific about what you like and don’t like. For example, if you say, “I just want you to use the vocals from the rough mix and then make it knock. I know the rest of the rough mix is too muted, but I love the way the vocals are sitting on top” or “I love the way the background vocals are blended,” that is information that is helpful to me. My experience is that a lot of musicians lack the vocabulary to talk to mixers about what they want. I think that’s very true. When I get a cold call or an inquiry through my website, I usually suggest, “Let’s talk about your project on the phone,” because things get lots via email and text. I think it’s important to clarify whether revisions are included in the price that you’re quoted. It has to be a professional relationship. You can’t be offended by criticism I give you, just like I can’t take the fact that you don’t like the first version of a mix personally. There has to be some sympatico, or you just get frustrated with each other, especially when you’re working long distance. If you are in the same room, you can work out the kinks more quickly. Whether or not I can be in the same room with someone depends often on budgets and the person’s location. I mix 80% of the records at my house, then go into the studio for just a few hours, because it keeps the budgets down, but allows whoever is making the creative decisions – whether the producer or the artist – and I to be in the same room together and make the small adjustments that can make all the difference in the finished product very quickly. These adjustments can take forever when done via email. Do you have any parting words of advice for people trying to make their way in the music business? That’s a tough question, because it’s a totally different industry from when I started. Coming into this business, you have to be prepared to work hard, be rejected and not be afraid to put your music out there. But there is so much music on the Internet – hundreds of thousands, if not millions of people trying to be the next big thing discovered. And that’s not really a feasible or realistic goal. You have to be old school in your approach. Network as much as possible. And if you’re going to produce, record and mix your own music, make sure you’re doing it at the highest possible level. Use songs that you like for reference and try to make your mixes sound as close to those songs as you possibly can. If you don’t a lot of A&R today can’t see past what they are delivered and don’t have time for artist development. They don’t hear really rough demos and think, “With the right producers and musicians behind this, it will be an amazing record.” They hear a rough demo, and it ends there. If you don’t hit them at the beginning, your stuff goes in the not-so-good pile. You need to fine-tune your craft until it is at the level it needs to be to compete. You also have to expand. For instance, don’t get it in your head that film and television work is beneath you. If you look at someone like Bonnie McKee, who wrote a lot of Katy Perry’s big hits, she wanted to be Katy Perry, but that didn’t happen to her right away. So, she started writing songs and became a great hit songwriter. And now she’s back to being an artist again, because the songwriting aspect put her in a position to be able to be an artist. She got to know producers, artists and other people in the industry and was able to put out her own record. Writing songs was a way for her to break into the business. She succeeded in one area of the music and was able to more easily transition into another. And look at revenue streams. Being a songwriter is a lot more lucrative than being an artist. But diversifying is critical. To learn more about Jason Goldstein and his work, visit the Jason Goldstein Mix Engineer website or follow him on Twitter.